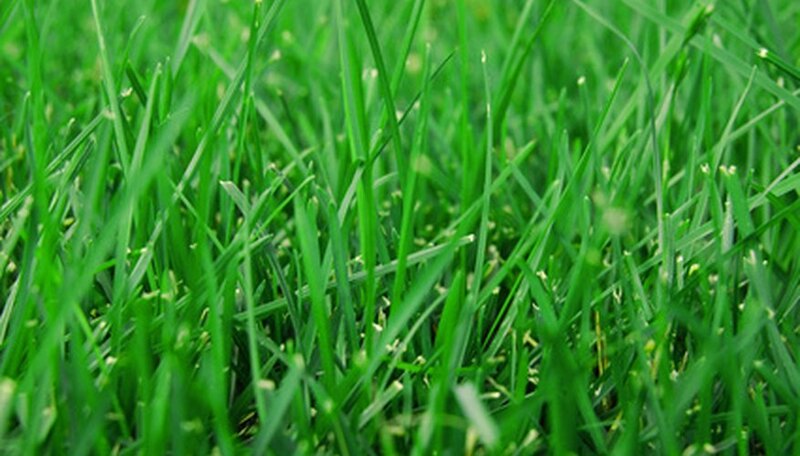 Lawn grass types are divided into two major categories: warm-season and cool-season grasses. In Connecticut, select a cool-season grass to grow in your lawn so that the grass will stand up to the cold Connecticut winters. Most cool-season grasses grow well from seed. You’ll need to consider other factors, however, in choosing the best grass seed for your Connecticut lawn, such as the required maintenance, seed germination and establishment time, as well as your desired lawn texture. Kentucky bluegrass is one of the most popular cool-season grasses and grows well in Connecticut’s climate, tolerating extreme cold. This grass is best for use in lawns with low to medium foot traffic, has a fine texture and creates a dense, lush lawn. Kentucky bluegrass seeds are usually blended with other types of grass seeds, such as perennial ryegrass, annual ryegrass or creeping red fescue, because bluegrasses have a slightly delayed green-up time in the spring. Although Kentucky bluegrass grows vigorously once established, the seeds can take up to one or two months to germinate and fully establish. Kentucky bluegrass also requires more reseeding, mowing, fertilizer and water than other types of cool-season grasses. Perennial ryegrass grows best in cooler climates, making it a good choice for Connecticut lawns. Perennial ryegrass is fast-growing and has an earlier green-up time in the spring. This grass is also extremely adaptable to many different soil types, and the seeds germinate quickly. Perennial ryegrass is low-maintenance, fine-textured, and resistant to diseases and insects. Establishing a perennial ryegrass lawn from seed takes little, if any, prior soil preparation, and this grass can withstand heavy foot traffic. Plant perennial ryegrass if your lawn is in a sunny area. Tall fescue is well-adapted to cold climates, making it an appropriate grass choice for Connecticut lawns. Tall fescue is fast-growing and drought-tolerant, but it may require some watering or irrigation during dry spells to stay dark green. This grass is also shade-tolerant and stays green year round. Tall fescue is low-maintenance, creates a dense, coarse-textured lawn, and germinates quickly and easily from seed. Fine fescue grasses, including creeping red fescue, has a softer texture than tall fescue, with narrower, deeper-green blades. Fine fescues also establish quickly from seed and grow best in colder regions like Connecticut and the Northeastern United States. Like tall fescue, fine fescue grasses are drought- and shade-tolerant, but fine fescues are not as tolerant of heavy foot traffic. American-Lawns.com: What's the Best Lawn Grass for You?